Fresh herbs are like the icing on the cake- They can add a perfect finish to your plate. Fresh herb of any kind can totally complete a meal. Throwing my herbs into the fridge after coming home from the supermarket doesn’t work for me! My basil leaves get brown (which I now know is because they get too cold in the fridge) and my cilantro tends to wilt or get slimy. The trick to having them fresh and on hand, aside from growing your own, is this simple trick! All you need is a mason jar, water, and of course the herbs. Do not wash them- They should be dry. It’s best to wash them as you use them. Cut off an inch or so from the bottom of the stems. Fill a glass jar 1/2 full with water and place the herbs stem end down into the jar. Basil and Parsley like room temperature and can be stored on the countertop. 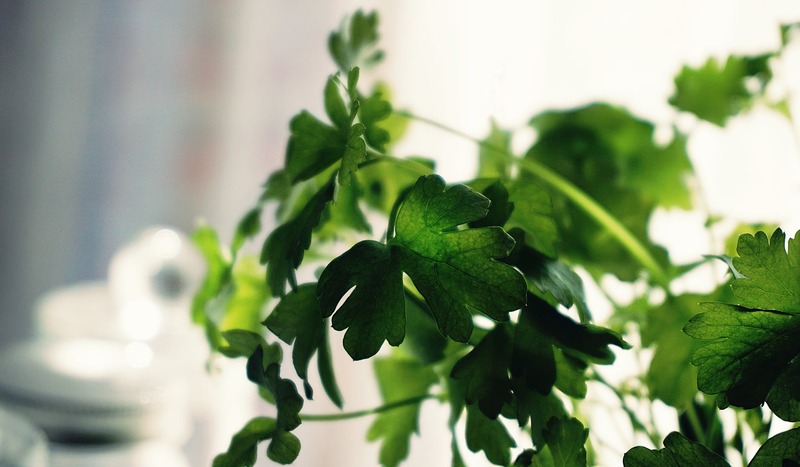 Cilantro does better in the refrigerator and covering loosely with a plastic bag will help keep them happy for longer. Be sure to change the water every few days. Thats it!! Your fresh herbs can last up to 2 weeks or longer when stored this way. I LOVE cilantro and basil! I use fresh herbs daily- I put them in my salad, soup, sandwiches, entrees, etc.. This trick has made it easier for me to keep them fresh and on hand. I love that I can quickly clip a few ends off, rinse, and enjoy. Fill Jar 1/2 way with water, place herbs stem side down. If storing Cilantro cover loosely in a plastic bag or saran wrap.